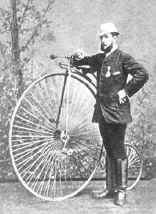 The first U.S. patent filed on bicycles was by Lallament, for his version of an improved velocipede. Like the earlier velocipedes, it was powered by crank arms and pedals attached to the front wheel. That must have made turning interesting. Later early bikes, called velocipedes, had a large front wheel, driven by a fixed crank. Each rotation of the wheel required one rotation of the pedals, since they were rigidly connected. The wheel had to be large so that the rider could go faster without having to pedal furiously on a smaller wheel. The tall wheel resulted in some tall crashes, and a need for a safer ride, by having smaller wheels. A smaller wheeled bicycle was made possible by the use of gears, so that one rotation of the pedals could be converted to many rotations of the wheel. Of course, when you have one gear ratio, a very small and weak motor (the human rider), and widely varying loads (the hills, downhills, and flats of a road), you will immediately find that you need more than one gear ratio. All kinds of attempts were made to provide variable and selectable gear ratios, as evidenced by a number of patents and products. The Sturmey Archer hub changed the gear ratio by having gears internal to the rear hub, which provided 3 speeds. This hub was popular through the 1960s for touring bikes, but not for racers. Internally geared hubs are still around for special bikes, like recumbents. Others devices changed the size of the chain ring, and some provided multiple chain rings that were selected by a fork repositioning the chain. Of course, when you change the size of chain ring that the chain is running on, that will produce a lot of slack in the chain, which has to be dealt with. 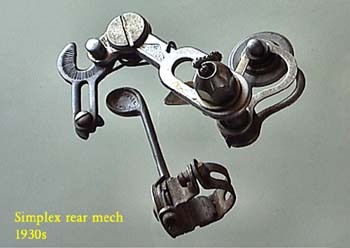 A functional derailleur was made by Paul de Vivie of France in 1905. 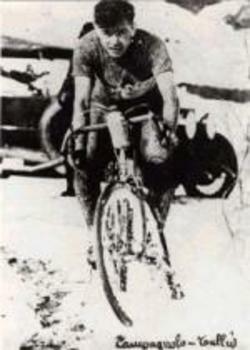 He published under the name Velocio, and was a proponent of bicycle touring and especially development of derailluers. Due to his efforts, the early derailluer makers were French. Across the channel, James Starley had leveraged his successful Rover into a megacompany, and became Raleigh bicycles. Raleigh bought Sturmey Archer, the internal hub maker. For this reason, Raleigh had no interest in derailluers, and shifter developments in England were limited. One of de Vivie’s designs shifted among four gears mounted on the crank. We would call this a front derailleur in today’s terminology. He made other designs that shifted the chain in cogs on the rear whell also. Today’s bikes use a derailleur at the front, and one at the rear, which yields a large number of gear combinations for use when riding. The European racers were at the forefront of technology, and for a long time they chose to use a rear wheel with a chain ring on each side of the hub. One chain ring was geared for uphill, and one for downhill. When they got to the top of the mountain pass, they would remove their rear wheel, flip it over, adjust the chain, and zoom off on the downhill gear. Part of this choice of technology was caused by the rules of the established racing organizations, which precluded new technologies, such as non-wooden rims, and derailleurs. 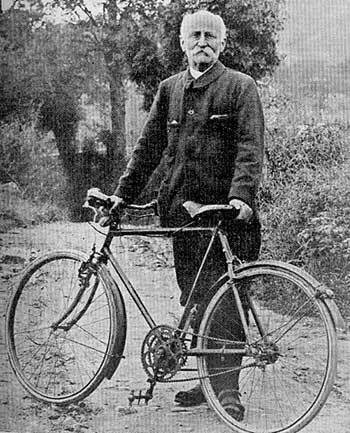 The use of multiple gears and derailleurs was also discouraged by “purists”, who viewed the need to change gears the sign of a weak or inexperienced cyclist. The need of racers to remove the wheel and flip it over prompted an Italian racer, Tullio Campagnolo, to invent the quick release hub. 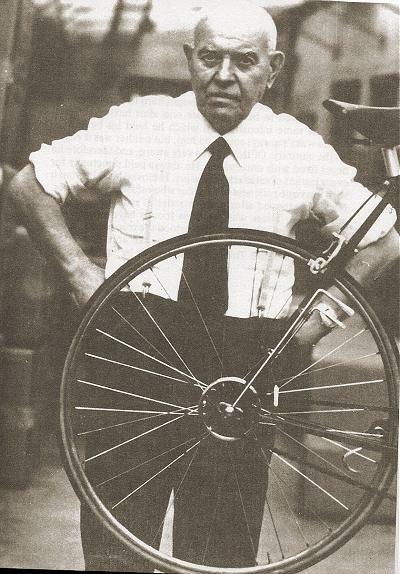 After his racing career, Tullio founded the Campagnolo company, whose products exhibited amazing design and finish quality, and are still among the most prestigious bicycle components today. Simplex made a functional rear derailleur in the 1930s, which was cable operated, and became a standard on road racing bikes. It used two cables, because the internal spring was not strong enough to move the cage in both directions, so one cable moved it one way, and another cable moved it the other way. In 1946, Campagnolo made a dual-rod derailleur called the “Cambio Corsa”, which used two levers that moved the chain from chain ring to chain ring, and also moved the wheel axle back and forth to take in the chain slack. Patent figures for the Cambio Corsa are here. The first derailleur that worked by moving the chain with an articulated parallelogram, called a cage, operated by cables, was made by Campagnolo in 1949. That model used two cables. 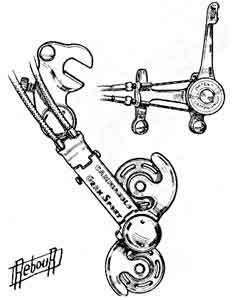 The first single cable parallelogram derailleur was Campagnolo’s Gran Sport, made in 1951. This derailleur would be recognizable as a modern derailleur, and is very similar to current designs in 2004.